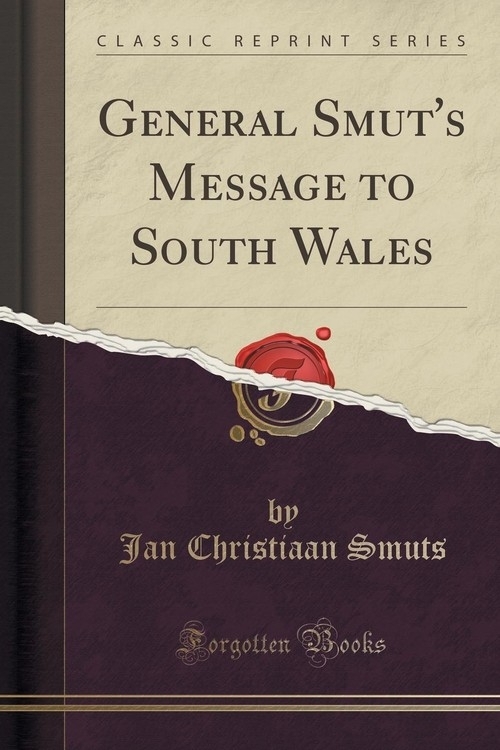 General Smuts, who was received with loud and prolonged cheering, said: Mr. Nicholas, ladies and gentlemen, I thank you from the bottom of my heart for the reception which you have given me here to-night. I was invited to attend and address a meeting at Tonypandy, and instead of having a meeting, this has turned out from Cardiff to here one of the greatest demonstrations I have ever seen in my life. (Applause.) Ladies and gentlemen, I thank you for what I have seen, and, I may add reverently, I thank God for what I have seen, because I have seen that the heart of Wales beats true. (Applause.) After three years of the agonising loss and suffering caused by this war, the hearts of this little Nation beat true. The hammer strokes of fate have not made you falter, but they have proved your metal. (Cheers.) Just eighteen years ago, I left Pretoria to go into another war. That war lasted for three years. For three years I was, figuratively speaking, up to my neck in it. The position I took up, and still take up, is that that war was a war for freedom. It was a war of a small Nation against the biggest Nation in the World. We fought to the bitter end (Cheers), until all our men, women and children were either in the field or in concentration camps at home or overseas, and then we gave in. We lost our liberty, but we soon got our liberty back again. (Cheers.) By Gods Providence what seemed to be lost to us was restored to us in a very short number of years, and, when that great result had been achieved, I never thought I would spend another three years in waging the same struggle over again.